Author Anna Marlis Burgard has had an interest in treasure hunting since she could walk. Growing up, her parents whisked her to a different island every summer where she would search the surf line for marine treasures. After researching more about them in the years to come and visiting over 100 islands in the U.S. for her website Islands of America: A River, Lake and Sea Odyssey, Burgard drew inspiration for The Beachcomber’s Companion. 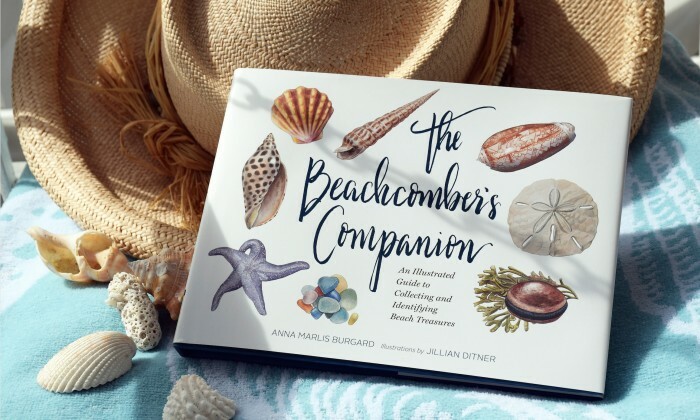 On April 17, Chronicle Books will release Burgard’s illustrated guide teaching readers how to identify the shells and treasures of saltwater shores, many of which are also found on Long Island. Those include whelks, scallops, moon shells and quahog clam shells. Burgard shared more about the research process and what fascinates her about these often ignored beach treasures. Nature and nurture. My mother was a poet. A close friend of the family gave me a bookbinding kit when I was very young after she saw my first book efforts with looseleaf paper, magic markers and staples. And my college required papers in every single class, including math and the sciences. I’ve always loved both the words and the packaging that presents them. I live on Tybee Island in Georgia. I had lived here previously, but moved away in 2010 for work and happily returned last fall. I missed it too much. I write anywhere where I can hear the birds and see the breezes ruffling the palm fronds and loblolly pine needles. How does your new book help readers understand and appreciate the beach treasures? I worked with a number of esteemed scientists (from the Smithsonian, Texas A&M University’s Sea Grant Program, Conchologists of America, Bailey-Matthews Shell Museum) to learn about the life of the shells as the houses to animals who are in turn fierce and fascinating. When you know what that snail was capable of, what a scallop went through to survive, how that conch shell was used by cultures long past, which shells and objects beachcombers consider lucky, the distance a sea bean traveled to reach the sand, the rare combination of factors that create clay babies on Fox Island in Washington, how ancient that arrowhead is…you’re naturally more appreciative. Without the stories and the facts, you might just see what you found as a salty souvenir. Have you ever been to the beach on Long Island? What is your favorite spot? I’ve visited many of Long Island’s beaches. I like lots of them for different reasons, but I’ve most often headed to Orient Beach State Park. OBSP is peaceful, has retained a pure, sort of innocent feeling so close to densely populated areas…and it’s a good shelling and colorful wave-tossed pebble stretch. What is your favorite shell and what don’t we know about it? Tough question, because I love so many of them for different reasons! Jingle shells were the first shells I collected…along with the purple and white shards from quahog clam shells. I’m nostalgic about them, and think the historical use of the quahog shells for wampum by the Wampanoags and other tribes is fascinating. The fact that their creature can live more than 100 years also blew my mind. I have a fondness for the baby’s ear shell, there’s something dear about it and soothing. Its snail is entertainingly outsized to its shell—it looks like a jellyfish wearing a little shell beret. But maybe my favorite is the sea star…watching a beaded sea star “walk” and contort itself like a yoga master for the first time was amazing. This thing you think of as merely decorative blowing your expectations—and that they’re accomplished predators prying mussels’ and clams’ shells apart to dine is also cool—since they look so serene when they’re long dead and dried by the sun.